As tradition holds, GRC athletes fanned out across the country this morning to compete in local Turkey Trots. Julie Tarallo netted the best prize of the year - her weight in turkey - by winning the Easton Turkey Chase five miler with a time of 30:02. Although the prize was less desirable, Stephanie Reich set a club record at the Way Station 5k with an unbelievable 16:42. Husband Stewart didn't do so bad himself with his 15:02, good for the W. And Stew wasn't the only winner. Maura, who has been on a tear on distances from the 5k to the HM, topped the podium at the PNC YMCA Turkey Trot in Pittsburgh (17:54). Although nothing edible ensued, the race sponsors are mailing her a turkey trophy. 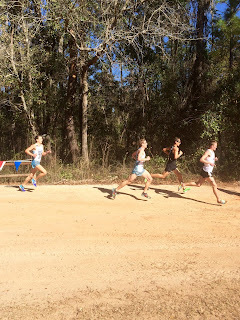 In the Midwest, Kyle and Evan grabbed pumpkin pies (seen below) after finishing third (15:35) and eighth (15:53), respectively, in the Minneapolis Turkey Trot. Fulfilling a long-standing quest, Dickson "the Nazarene" Mercer broke the tape at the Nazareth, PA Run for the Pie with a formidable 16:19 on a fair course. 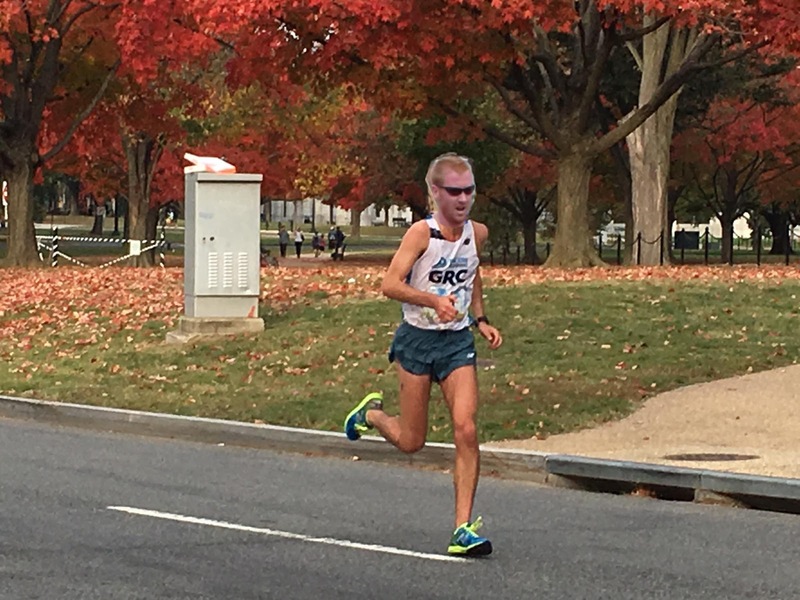 Meanwhile, in Fairfax, Dave O put in a 17:17 with Laura pushing the stroller in in under 22. Out west, David McKay gobbled up several local high schoolers to break the tape at the Missoula, Montana Turkey Trot 8k (26:16). His efforts were met with a gorgeous apple pie. Matt Hassett received a well-earned "Top-100" finisher ceramic coffee mug for his efforts of 26:25 at the Ashenfelter 8k in New Jersey. This author had a forgettable performance in the Southborough, MA Gobble Wobble, but his wife set a "pregnancy PR" for the 5k. Our efforts returned no prizes after some rapscallion absconded with the Dunkin' Doughnuts cache reserved for rewards shortly after the gun went off. We are awaiting the results for Jake Klim's Thanksgiving athletic activities. Patrick Murphy has also been known to hit the roads on Turkey Day, but no results for him have surfaced. Keely Eckberg smashed her sub-3 goal this morning at the Philadelphia Marathon running 2:56:18, a 5 minute PR. Keely executed a strong, smart race nailing even splits en route to a 16th place finish among women. Keely's run is all the more impressive considering conditions were less than ideal with strong winds, and she's battled a cranky Achille's the last few weeks. 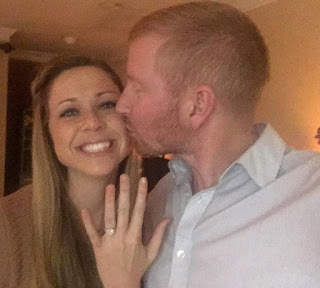 Keely revealed her secret to success to be chowing down on eight servings of rice on marathon eve, but this blogger thinks Keely's immense dedication and unfailingly positive attitude were strong contributing factors as well. 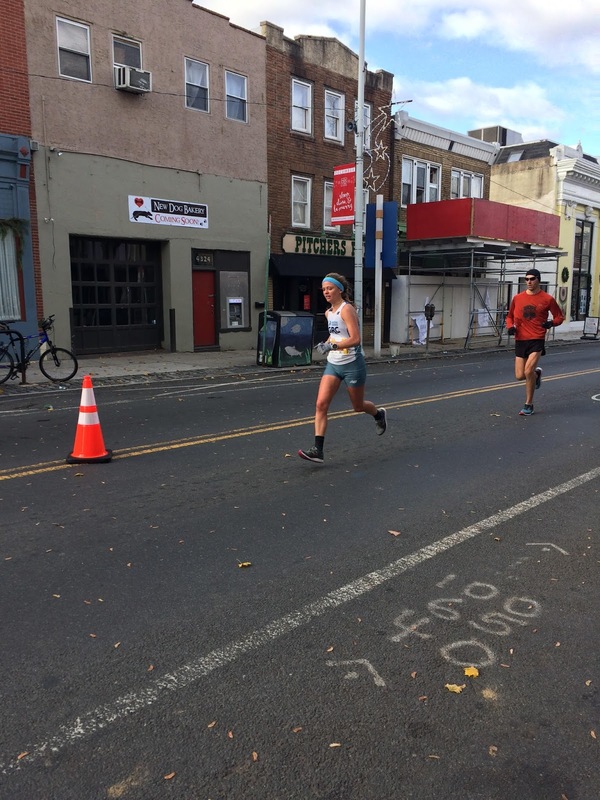 On Saturday, Elena Barham made a very strong half marathon debut in Philadelphia, placing 11th in 1:21:14. This was Elena's first race over 10k and only her third road race. Look for Elena to continue to roll at clubsclubsclubs and on the roads for years to come. Six years ago to the day, Jake Klim predicted that GRC ex-pat Joe Wiegner would "meet a babe" whom he would "make love to," which would result in the birth of a "beautiful baby wiggy." 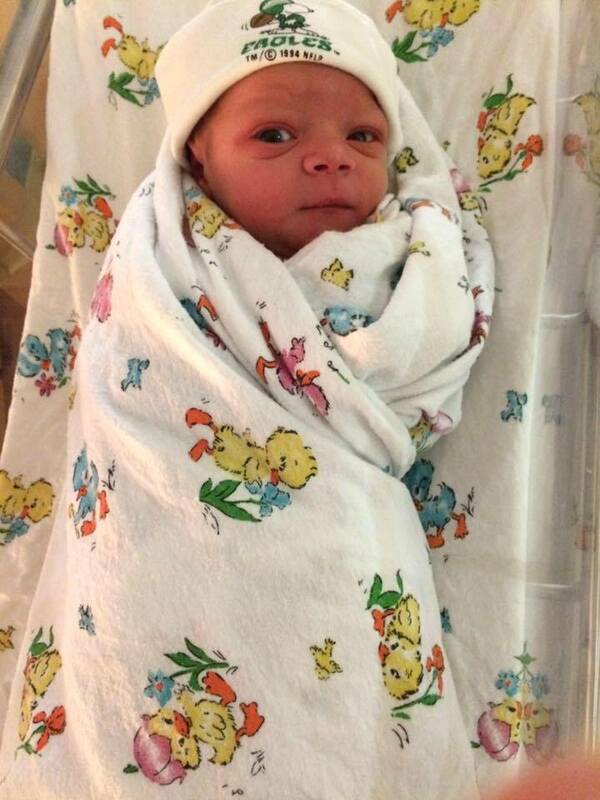 Well, folks, it happened Friday when Wiggy and his wife brought a wonderful Baby Wiggy into the world. 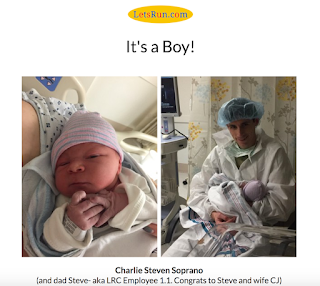 Congratulations Joe and family! 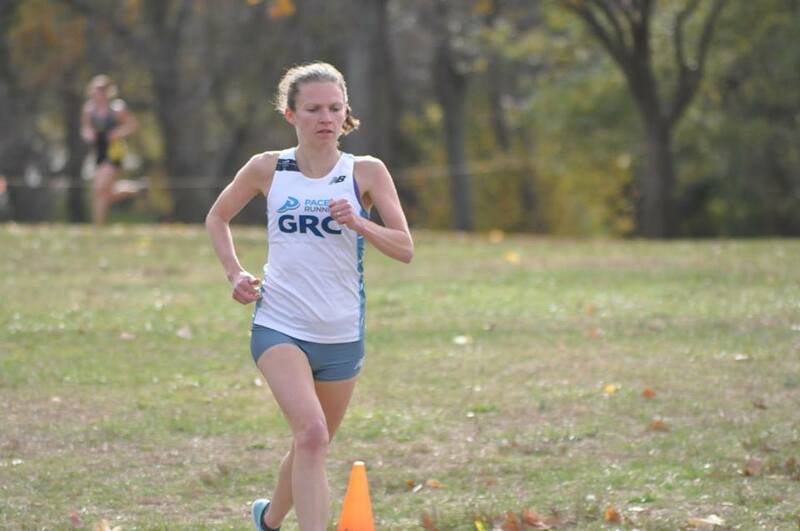 Maura Carroll had a major breakthrough in Richmond this morning, breaking 1:20 in the Half. This is a big PR, which Coach Jerry Alexander described as the best long road result of Maura's career. Carol has been increasing her race distances incrementally and, as someone whose half marathon PR was also set in Richmond, I will attest that the course is more than fair. Julie (Half) and Greta (full) had solid results with 1:23:11 and 3:01:56, respectively. 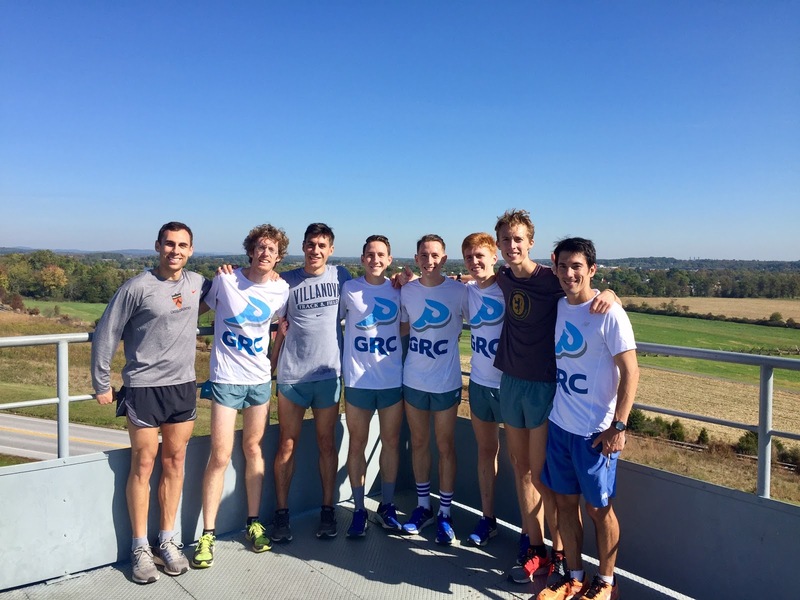 FLASH: Pacers GRC Men Capture MCM Open Team Title! The Pacers GRC men took top honors in the Marine Corps Marathon men's open competition, with an average time of 2:34:34 for the top three scoring runners. This result bested the Greater Boston Track Club, which finished with an average of 2:44:27. 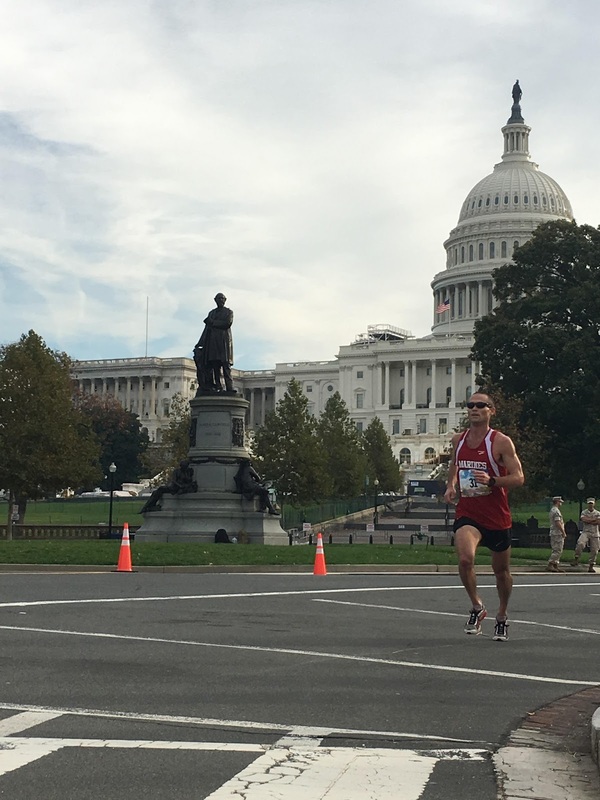 GRC's team result would have earned its squad second place in the Armed Forces Challenge Division by finishing behind only the U.S. Army squad, which posted an average of 2:29:51 (including a 2:23 by the first place finisher). Notably, Jake Klim's time (reputed to be in the high 2:20's) was mysteriously excluded from the GRC's average. Sean Barret's impressive 2:34:04 was good for first scorer on the all Marine team. A look at the numbers reveals that this successful result was achieved by fielding a team of substantial depth for which every runner went to the well. This was a model of disciplined running. Every runner formed a race plan and stuck to it, which allowed every member of the team to finish in the ballpark of what we knew was possible. Although one would have expected more carnage given the raceday conditions, smart running enabled all five men to finish with commendable results. And this depth is the key to winning team competitions at major marathons - all three of the GRC's scorers were within 3:30 of each other. 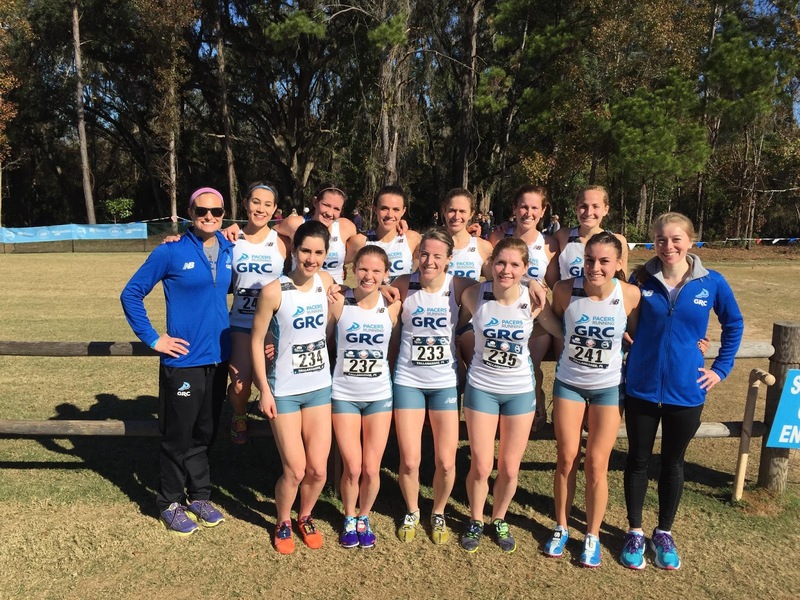 That each runner on the GRC's roster got out and competed and put in a very strong result on a tough course on a hot day is the headline. This is a big weekend of racing for Pacers GRC. On Sunday, Kerry "the Banana" Allen will hit the streets of the Big Apple to contest the eighteenth running of the New York City Marathon. Temps look quite favorable for marathoning while winds will be breezier than optimal. "Kerry is in great shape and looking for a PR," says Coach Jerry Alexander. While the rigors of the NYC course and the likelihood of winds may take fast times off the table, this race will provide an excellent opportunity for Allen to get in there and beat as many other runners as possible. If she stick to her plan and runs her race, she is sure to be part of a small and select group of finishers. 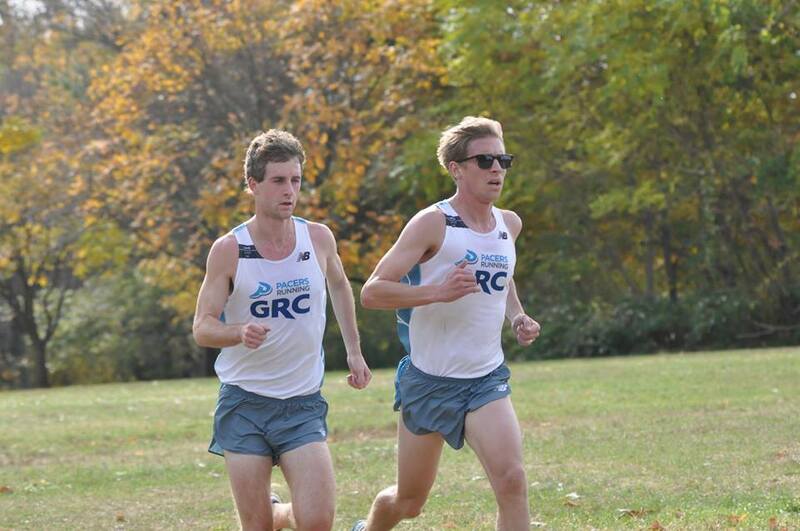 GRC harriers will also traverse hill and dale at the USATF East Regional XC meet up in Philly this weekend. Our runners are looking to test their mettle on this challenging course against the Garden State Track Club, which is a formidable adversary. The lineup for the men is Phil, Luke, Stewart, Michael P, Cabell. David M, Sean O, Kyle W, and Fridge. 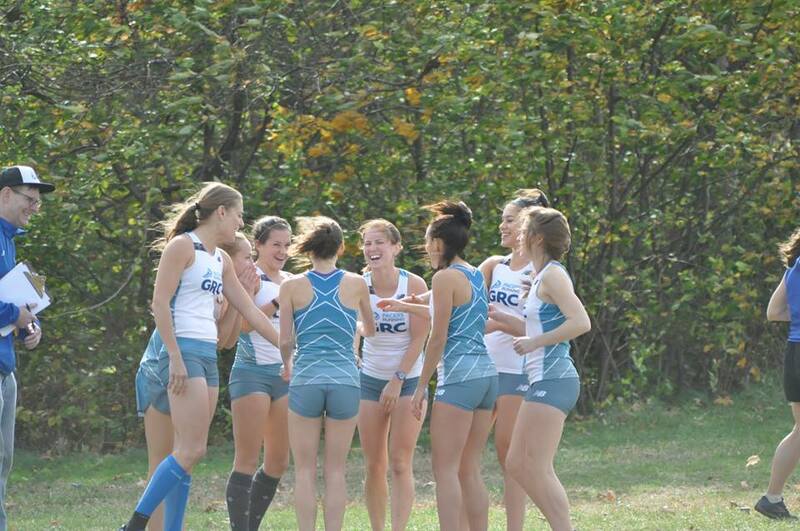 Steph, Elena, Elyssa, Frances, Chelsea, Liz, and Lindsay B comprise the women's' team. Alexander is looking for big results from Phil, the defending men's champion, and Steph, who is on a hot streak. 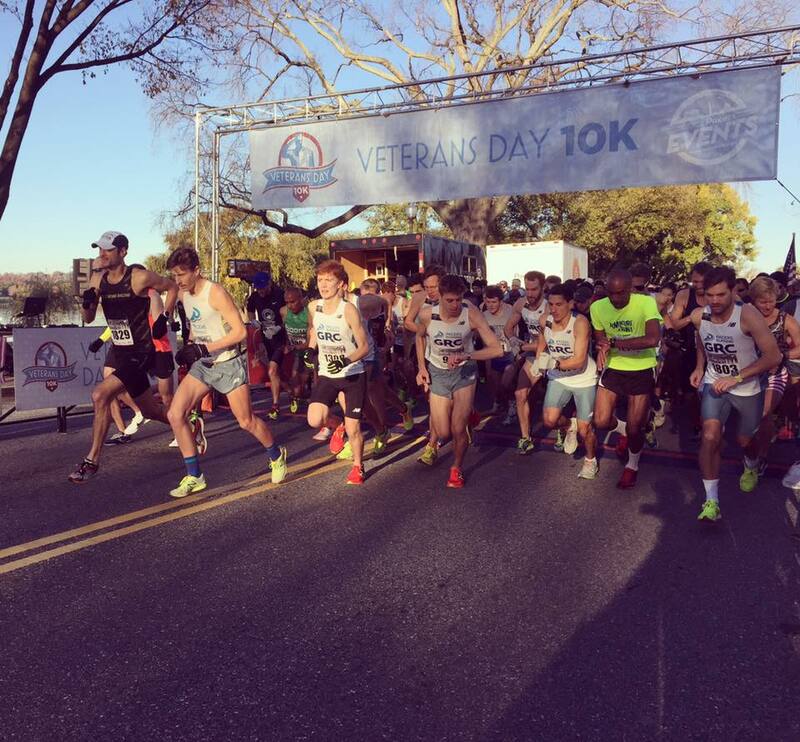 I am extremely proud of our performance at the Marines Corps Marathon. 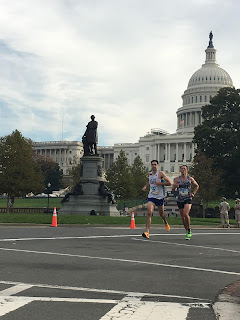 It was a very warm and humid day for a marathon, and the course was even more difficult than normal because of the extra distance and turns in Virginia, but that did not prevent our guys from turning in an excellent morning of racing. 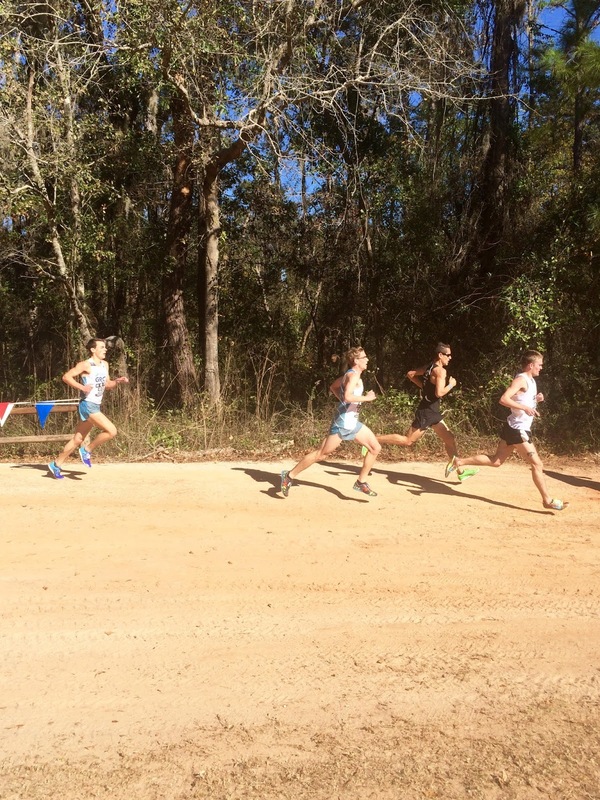 Jerry Outlaw led the way, finishing 6th in 2:33:14, followed closely by Blake in 8th in 2:33:52, Sean Barrett in 10th in 2:34:02, Graham in 14th in 2:36:34, and Breezy in 76th in 2:55:10. Outlaw ran a superb tactical race, going out relaxed and picking up steam in the later stages, and he went from outside of the top 10 at 20 miles to 6th at the line. For a reason that we've yet to determine, Outlaw did not feel wonderful from the start, and he even considered dropping out in the middle miles, but he hung tough, and showed why he has a great future in the marathon. To my way of thinking, Outlaw is a legitimate contender to make the Olympic Trials in 2020, and as he improves steadily each successive training cycle and continues to fine tune his approach to marathon training, we are going to see some fast times from him in the near future. 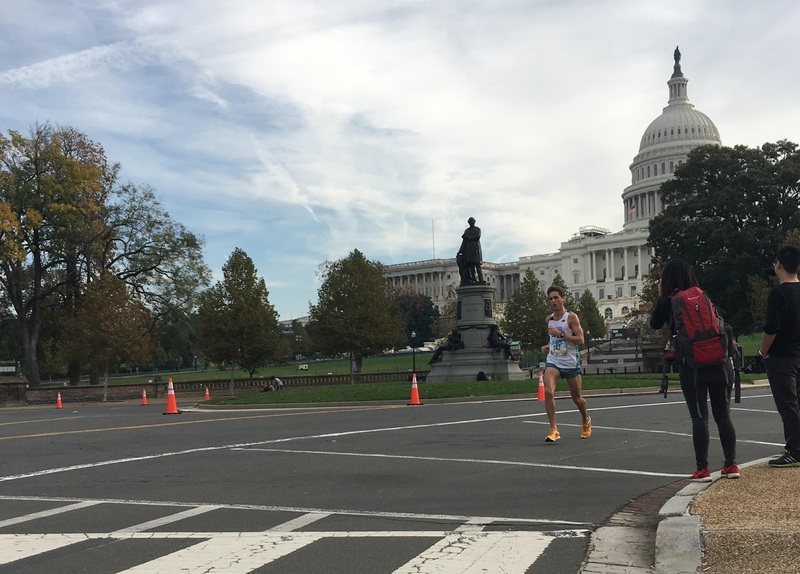 Blake made an outstanding marathon debut, competing the entire distance, and finishing strong. Blake ran stride for stride with an Army athlete for the final 18 miles of the race, and Blake and the eventual 9th place finisher dueled it out all the way to the tape, with Blake going past him for good up the final hill. Blake has great potential in the marathon, and while his medical school schedule will be an obstacle to his immediate progress, I am sure we will see more from Blake in the this event in the future. Graham had an outstanding training cycle, and I would not have hesitated on October 1 to deem him our top entrant, but he developed a hip issue that prevented him from doing more than a couple of runs in the last 3 weeks. If that wasn't bad enough, the anti-inflammatory he took before the race caused him to have stomach problems that mandated a pit stop on Hains Point, ruining his chance to compete for a top 5 finish. But despite those considerable obstacles, Graham fought all the way to the tape, and produced a very solid time on a difficult day. Graham is a great talent, and we will see some outstanding performances from him in 2017, and beyond. As impressive as those performances were, to me the big story of the day was Sean's race. As you all know by now, Sean is deploying to Iraq tomorrow, and it took a good bit of negotiating for Sean to obtain clearance from the Marine Corps to even get on the starting line. Despite having his training interrupted by a site visit to Iraq last month and a demanding series of field exercises to prepare him for the daunting challenges he will face overseas, Sean got in a reasonable buildup, and even though he knew his training wasn't ideal, he was determined to take a shot at a top 5 finish. Sean's plan was to go with the lead pack early, bide his time at the back of the group, and make a move when the opportunity presented itself. Sean executed the plan perfectly, and by the time we got across the 14th Street bridge (and I say we because I rode my bike with Sean from the Key Bridge to the finish--and don't think I'm not sore today from the ride), Sean had moved into 6th place, and was well clear of the chase pack. At around mile 22, I thought Sean was ready to take a shot at catching the runner in 5th place, and he was running strong and controlled. And then at around mile 24, seemingly all of a sudden, he was not. The lack of long runs due to weekend exercises and dehydration from the heat conspired to put Sean into a dark place that none of you ever want to experience, and by mile 25 Sean was "seeing black stars" and barely moving. He had built up enough of a gap on his pursuers that I thought he might be able to hold on for 6th place, but the finish line could not come soon enough, and in the last 800 meters Outlaw went by him, followed by another athlete, and by the time Sean turned for the final hill, Blake and his Army travelling companion were approaching fast. I hoped that Sean could hold on, but the hill was too much, and Sean literally walked up it, and it was all he could do to stagger across the line in 10th, completely and utterly spent. I've seen a lot of runners run a lot of races, and I don't know that I've ever seen anyone fight as hard with as little in the tank as Sean did those last 2 miles. I couldn't be more proud of Sean's effort, and I eagerly await his return to competition after he finishes his tour in Iraq. Not to be ignored in all of the excitement over MCM is the fact that we had some strong performances at St Ritas 5k on Saturday. 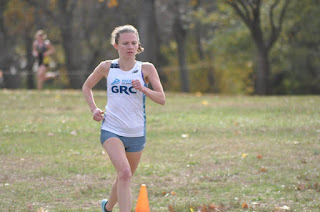 Amy L ran an excellent 17:20, which ties her for 4th on the GRC all-time list. Amy's performance is particularly impressive because she had a nasty illness earlier this month which disrupted her training. Elyssa ran approximately 18:20 (the results are inaccurate), and she will run much faster in the weeks ahead. For the guys, Ryan ran 15:40, followed by Wertz in 15:42, and Evan in 16:14. On a morning better suited to spectating a marathon rather than running one, GRC piled at least four men into the top 15 at MCM. Temperatures remained in the 60's throughout the race, but the humidity wreaked havoc on the field in the latter stages. Numerous eyewitness reports indicate that Jake Klim was in the lead pack through at least 18 miles. While race officials deny participating in a conspiracy to remove Jake from the runner tracking system, the e-mail thread released by WikiLeaks with the subject line "the fix is in" raises serious questions. 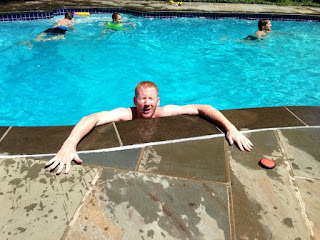 Anyone with photographic evidence of Jake finishing is encouraged to come forward. 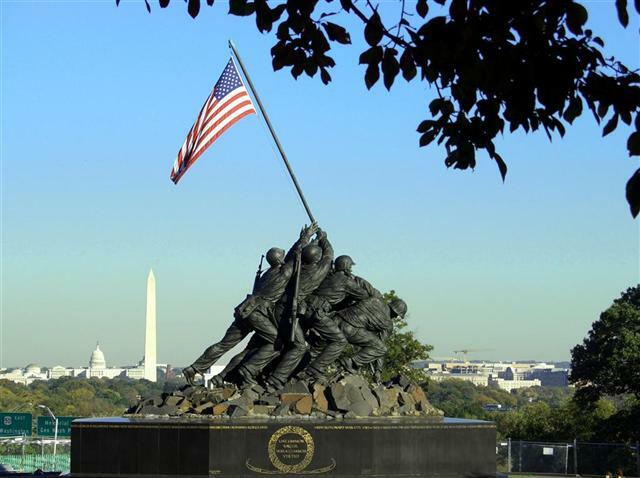 Coach Jerry previews the Marine Corps Marathon below! Our crew is Sean Barrett, Jerry Outlaw, Blake, Graham, and Breezy. The marathon is an unpredictable event, and you never know who is going to show up ready for a big breakthrough, but I think Sean, Outlaw, Blake, and Graham all have an excellent chance to place in the top 10, and quite possibly in the top 5. If one of them has a really good day, it's well within the realm of possibility that a GRC athlete could get the win. A case could be made for each of our athletes as our leading contender. Sean is the clear sentimental favorite--not only is he an active duty Marine, he is deploying to Iraq next week, and it would be an amazing story if he were able to run well while facing the incredible pressure and stress of an imminent deployment to a war zone. Outlaw has trained exceptionally well for MCM, and has logged lots and lots of miles, and done many marathon-specific workouts. He is an expert tactician, and in his previous attempt at the distance, when he ran his PR of 2:26:50, he ran precisely even pace for the two halves of the race, and he will look to move up in the latter stages of the race on Sunday. Graham's training was going extremely before a recent hiccup, and he's fully rested and feeling good. At his best, Graham is a formidable marathoner, and he is in PR shape. Blake is an intriguing newcomer to the marathon who has run very fast at shorter distances (29:12 track 10,000), and while he lacks experience, he is a dogged competitor who has run some outstanding workouts in recent weeks. Breezy could be critical to our attempt to win the team competition, in which the top 3 score. Because Sean is running for the Marine Corps team, if one of our top 3 struggles, Breezy will be the safety valve, and he is taking that responsibility seriously, and will give it everything he has. We had some strong off-road performances this weekend. 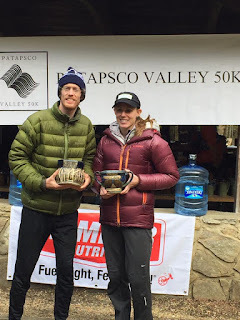 Stewart and Steph took on the immense challenge that is the Spook Hill Cider and Wine 4 Mile Run, which is run on a combination of grass, trails, and roads, and despite the amazingly high level of competition, they came in first and second. Stewart not only got the win in 20:19, he caused the lead biker to retire a mile in for inability to keep pace. Steph was a strong second in 22:38, which was faster than the previous course record for men. I don't want to make any wild predictions, but I'm going to go out on a limb and say that those two spunky kids have some more victories in their future. Balmer is putting in some time in the home office in Portland for his Congressman, and he placed 5th in the Stumptown XC Race # 3, a 4 miler on rugged terrain, where he ran a very solid 21:45 despite taking a nasty spill. Paul will have another shot on the same course in two weeks at the Oregon USATF championship, and he's looking to stay vertical the next time out. Additionally, many GRCers did a solid workout at the cell tower field on Saturday rather than racing and they had a special visit from one of GRC's first babies! FLASH: Klim alleges "irregularities" in MCM runner tracking system, hints he will not accept results! Breuters Wire Services - Washington, D.C.
"My goal during this marathon campaign has been to challenge the running elite and the fat cats in Washington. 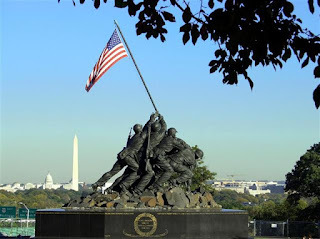 Unfortunately, powerful forces in the mainstream media and running establishment are conspiring to ensure that I do not take my rightful place as the champion of the Marine Corps Marathon. If my name does not appear in the MCM race results this weekend, it can only be because the runner tracking system is rigged against me. Rest assured that I will be out on the course this weekend making the GRC great with every step I take and that I will accept the race results without hesitation or qualification, if I WIN!" Klim added that, no matter the result, he would continue his quest in the Fall of 2017. Stay tuned to this blog for updates on this sad chapter in our nation's history. Dave McKay ran 3:57:12 to break the course record at the Patapsco Valley 50k on Saturday by more than a half hour. He a lead of almost 10 minutes over the previous course record holder. Many of the Pacers//GRC New Balance guys continued cross county success at the Gettysburg Invitational (8k) on Saturday. Michael Palmisano lead the team in 25:49 for a second place finish in his first D-III cross country race. Kyle Wagener ran a 26:19 for 8th, less than 5 seconds off his time from Paul Short a few weeks ago on a tougher, slower course. Luk Olenginski finished 16th in a time of 26:29 and Greg Olenginski finished 18th in 26:34, both running faster than last year on this course. David McKay ran a solid 26:35 for 19th. Dave Wertz improved almost 20 seconds from last year in 26:46, finishing 21st, which is especially impressive given he is almost double the age of the majority of the field. And Sean O’Leary finished 22nd in a time of 26:48, only 2 seconds off his time from last year. This team utilized some good pack running and managed to beat all but one of the 25 other teams.